This week my post will still be a small one, as my time is still limited during the move to our new home. In between I was still doing some work and trying to find a subject for a presentation/ demo. During that I was working with the Configuration Baseline of UE-V. That baseline is completely based on one Configuration Item, which consists of eight script setting types and those scripts are all written in PowerShell. The deployment of the baseline resulted in error 0x87D00327, which translates to ‘Script is not signed’ (see picture). Bypass: The ConfigMgr client bypasses the PowerShell configuration on the local system so that unsigned scripts can run. Restricted (default in ConfigMgr 2012): The ConfigMgr client uses the current PowerShell configuration on the local system, which determines whether, or not, unsigned scripts can run. 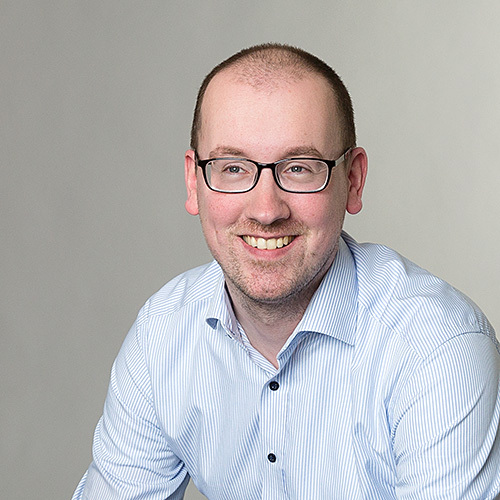 All Signed (default in ConfigMgr 2012 SP1):The ConfigMgr client runs scripts only if they are signed by a trusted publisher and applies independently from the current PowerShell configuration on the local system. In the Configuration Manager Console navigate to Administration > Overview > Client Settings. On the Home tab, in the Create group, select Create Custom Client Device Settings and the Create Custom Client Device Settings –popup will show. On the General page, fill in with Name <aName> and select Computer Agent. 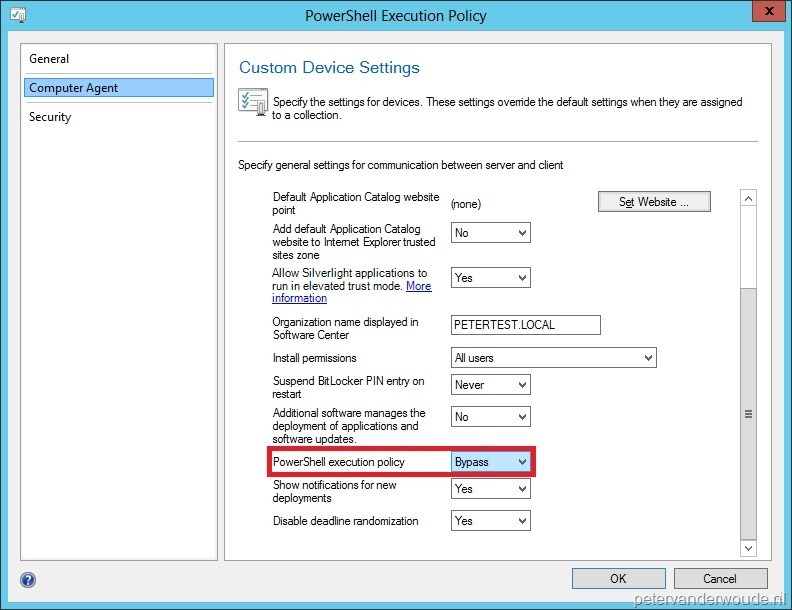 On the Computer Agent page, select next to PowerShell execution policy Bypass and click Ok. 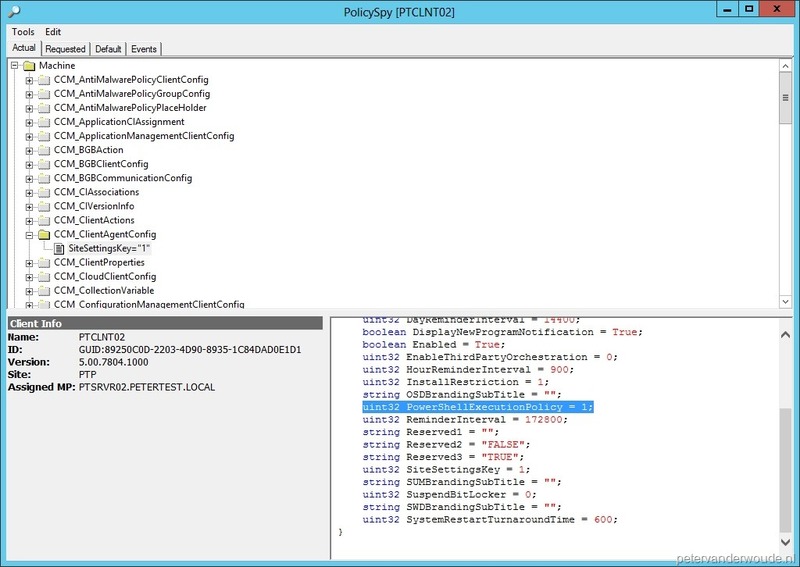 Select the new policy <aName> and on the Home tab, in the Client Settings group, select Deploy. Select <aDeviceCollection> and click Ok.
Hi Peter. Just a question on this as I am not sure which way to look at this. By doing the unsigned setting via the SCCM client does this mean that the powershell scripts will run unsigned if coming from the SCCM client, but still will not allow scripts running outside of SCCM client as unsigned? In other words, once this is set, will any scripts no matter how they run, run unsigned, or only the ones coming from SCCM? That only applies to the script started by the agent.